Warning: This recap includes spoilers for Episode 12 of "Star Trek: Discovery," along with discussion of sensitive and potentially triggering topics. The strange behavior of Gabriel Lorca (Jason Isaacs) finally has a physical explanation rather than just plain old PTSD from seeing his last crew killed. As "Star Trek: Discovery" fans found out in the final few seconds of Episode 12, "Vaulting Ambition," Lorca is from the alternate universe. Because "Star Trek" fans are smart people, some correctly guessed Lorca's origins many weeks ago. In an interview with GamesRadar in November, Isaacs said that while some theories are right, nobody's got the whole puzzle yet. "More power to them," he added. "People should continue to come up with these theories. Some people will feel really smug at the end of it. Some people will feel really stupid at the end of it." Anyway, Lorca is finally free from the torture he's been stuck in for the last three episodes, and he's just killed one of Georgiou's crewmembers. Apparently, they had some beef about a woman called Ava; more to come in Episode 13, which will be released next Sunday (Jan. 28) on CBS All Access around 8:30 p.m. EST. There's not much else to say about the other subplots, but here's where we stand. Burnham and Lorca transport over to the imperial flagship, ISS Charon, where Georgiou is waiting. 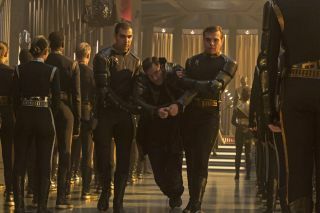 Lorca spends most of the episode being tortured, but eventually breaks free. Meanwhile, Burnham reveals her true identity and brokers a deal with Georgiou. Georgiou will give over the information about the USS Defiant to help the USS Discovery escape, while Burnham will send over information about the USS Discovery's spore drive. Will this agreement hold? I guess we'll find out in the next episode. "Normal universe" Paul Stamets (Anthony Rapp) wanders around the alternate-alternate universe in his brain (and inside the spore network) along with alternate-universe Stamets (also Rapp). Turns out, the two men have a lot in common — they're both trapped in comas and they're both experts on the weird "Discovery" brand of hyperpowerful spores. Normal Stamets also meets up with his partner, Hugh Culber (Wilson Cruz); Culber confirms he was actually killed back in Episode 10. . The Stamets-Stamets-Culber discussion reveals that the spore network is going haywire and will have terrible consequences unless the two Stamets do something about it. They both wake up from their comas near the episode's end (I have a comment about that below) and get to work. Unfortunately, by then, the spore network has already taken over part of the USS Discovery.